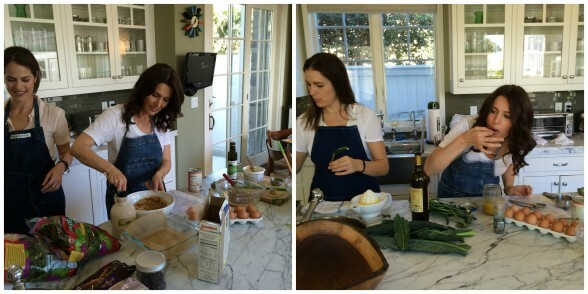 A few weeks ago, my friends Zelana and Gina came over to play in the kitchen with me. 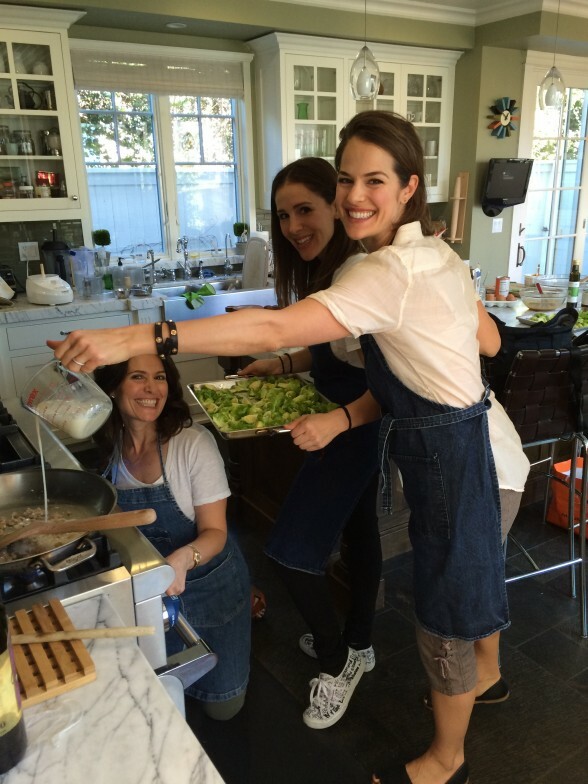 The three of us all have the love of cooking in common, but more specifically, cooking with natural foods. Zelana, whom her readers call Dr. Z., has her masters and doctorate degrees in clinical psychology, is a wellness expert and TV Host appearing on the TV Guide Network as well as other networks such as E! and Good Morning America on ABC. Gina is a holistic health coach and partner in a delicious LA vegan cafe called Falabar. Plus she makes the most incredible sprouted snack mix called “Gigi’s Remix.” We thought it would be fun to try out some holiday recipes on each other and we had a blast, in addition to a delicious lunch! We each picked a dish that was really easy to make and we kept it vegan. 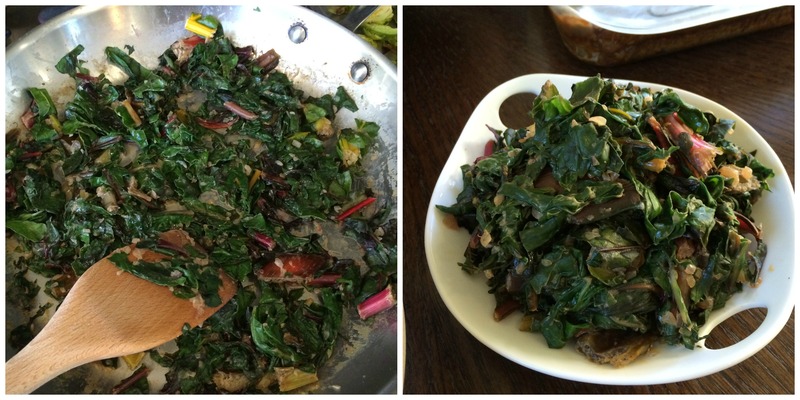 Zelana made a yummy “creamed” Swiss chard, which is very exciting for any dairy-free folks since there was no cream used at all. Zelena used coconut milk to make it creamy,but somehow it didn’t taste coconut-y at all. 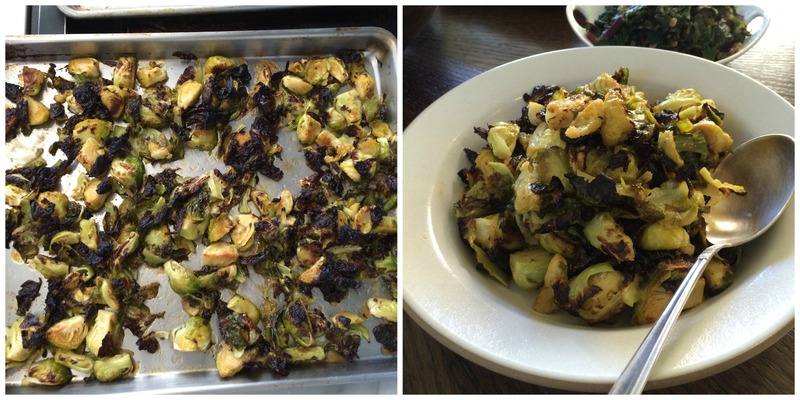 Gina roasted these delectable miso-maple Brussels sprouts, which is something I’ve always wanted to try. I am crazy for miso, which is a salty soybean paste, and I am crazy for maple. Sweet and salty is my thing and on the Brussels sprouts it was amazing. I put together a fresh, seasonal twist on my classic kale salad to which I added thinly sliced raw fennel, pomegranates, toasted pistachios and fresh mint. It was refreshing, crunchy and would be great with a meat meal or veggie. After lunch, we indulged in some vegan Magic Bars which satisfied the sweet tooth in all of us, while still keeping the ingredients clean. So many of our readers asked us for the recipes, that I decided to post them here. They would be the perfect addition to any holiday dinner! Since this wasn’t a planned post, our images are all from our iPhones! Let me know if you have any questions about the recipes since I am lacking the normal step-by-step photos. Add chopped shard stems, shallots and garlic and saute, stirring frequently, until tender and translucent. Stir in flour, 1 teaspoon of nutmeg, salt and pepper to taste and cook for a couple minutes until fragrant. Pour in coconut milk, stirring frequently over high heat, until thickened and reduced by half . Add in chard leaves and orange zest, cook until soft and coated. Season with an extra pinch of nutmeg and sea salt to taste. Pre-heat oven to 375*F and line a baking sheet with unbleached parchment paper. Toss sprouts with the oil until evenly coated and arrange on prepared baking sheet. Season with salt and pepper. Whisk together the miso and maple syrup in a large bowl. After the sprouts have cooked for 20 minutes, remove them from oven, let cool for a bit and add to the bowl with the maple-miso dressing. Toss the sprouts until evenly coated and return them to the baking sheet. Cook for an additional 10 minutes or so, depending on how crispy you like them. You can also broil them until browned and very crispy, just be careful not to let them burn. Strip the kale leaves from the stems and compost or discard the stems. Finely shred the leaves with a sharp knife. Place in a serving bowl with the fennel. Prepare the dressing: whisk all the ingredients in a small bowl until emulsified or place all dressing ingredients in a glass jar with a lid and shake until emulsified. Add enough dressing to coat the kale and fennel lightly. 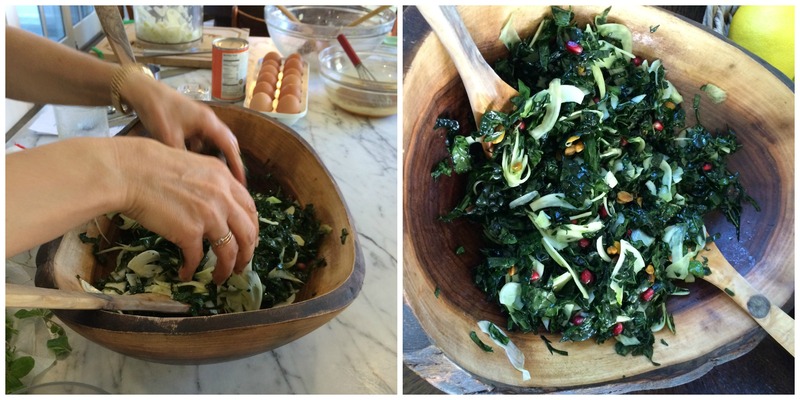 Massage the dressing into the kale leaves and fennel slices with your hands to soften the leaves. Add the pomegranate seeds, pistachios, mint leaves and toss. Salad can be served at once or allowed to sit and soften further. This salad would be delicious with crumbled feta, too.